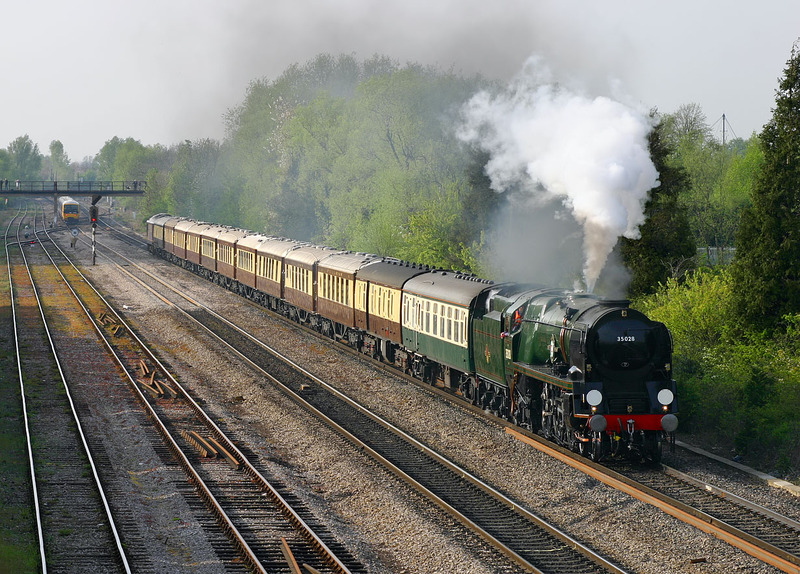 Merchant Navy Class 4-6-2 35028 Clan Line passes Hinksey Yard, near Oxford with the 1Z83 17:31 Oxford to Victoria VSOE special on 21 April 2007. Luckily the tour was ten minutes late leaving Oxford, as at the correct time the 4L44 Cowley to Purfleet car train was running round in the yard, and the blue covered car transporter wagons on the second line in from the left in this picture extended all the way to the signal in the background, effectively ruining the shot. To the relief of the photographers present on the bridge, the last wagon had just passed under us as the train came into view!